What does love mean to you? It’s a big question, but everyone has their own special answer. 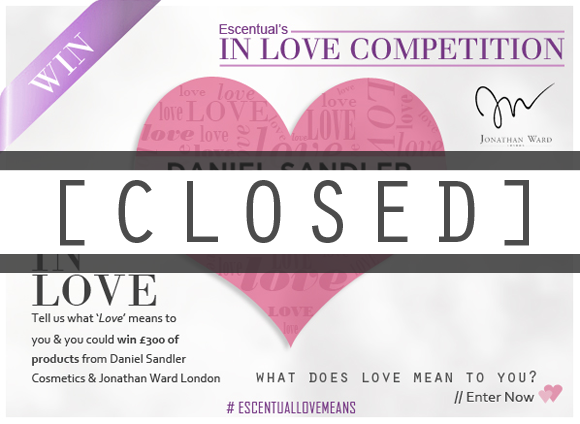 Tell us what love means to you over on this competition page before 14th February 2012 and you could win £300 worth of products from makeup maestro Daniel Sandler and artisanal candle creator Jonathan Ward London. Daniel Sandler is a renowned British makeup artist with a difference. Not content with simply beautifying his celebrity clients, he created Daniel Sandler Cosmetics, a range of high performance, luxurious makeup that brings out a woman’s natural beauty. Founded in 2008 after four years of fragrance research and design, Jonathan Ward London has quickly gained an enviable reputation for producing the finest quality scented candles. All candles are hand-poured using the finest artisan craftsmanship, and each fragrance is a sophisticated blend of premium ingredients and scents, lovingly selected and expertly combined. To supplement his luxurious collection of cosmetics, Daniel Sandler teamed up with Jonathan Ward to offer women an entire multi-sensorial pampering experience. The result is the ‘In Love candle‘, a uniquely couture product that has the heart and soul of its creators poured into every detail. The candle is the perfect gift for Valentine’s Day, with its deeply romantic notes of vanilla, musk, patchouli, clove, violet and black pepper. This entry was posted on Monday, January 23rd, 2012 at 5:44 pm and is filed under Competitions, Make-up. You can follow any responses to this entry through the RSS 2.0 feed. You can skip to the end and leave a response. Pinging is currently not allowed.